Somewhere in a shoe box, there’s a picture of me taken a couple of months after I got off the plane from Hungary; I’m crouching on the pavement, placing my 19-year-old palm into the handprint of Steven Spielberg in front of Grauman’s Chinese Theater. That was a long time ago, but it was profound to remember that first trip to Los Angeles as I prepared for the LA premiere of The Advocate at what is now the TCL Chinese Theaters. So much has changed. The theater has extended into a multiplex, and none of the screening rooms project film anymore, having been converted to the latest digital wonders. And yet, a premiere at the Chinese ended up being just as much fun as I had imagined when I was a kid. It was certainly an awesome way to see this movie with all our LA friends and all the wonderful people who worked so hard on it. Many thanks to the Dances with Films Festival, Leslee Scallon, Michael Trent and Robert Mellette, for selecting us and hosting this special night for The Advocate, and to all of you who came to celebrate it. It was the end of one part of the journey and the beginning of another. As I announced after the screening, the movie was picked up for North American distribution and is scheduled to be released later this year. We look forward to sharing it with the world next. 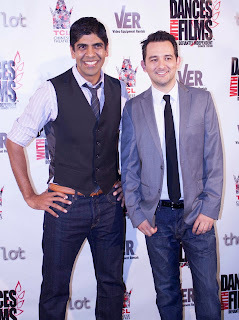 DWF Premiere of The Advocate, a set on Flickr.